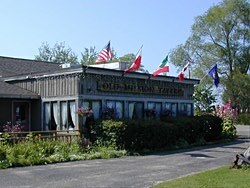 Situated on beautiful Old Mission Peninsula in Northwestern Michigan, surrounded by the crystal clear blue waters of Lake Michigan, and in the midst of orchards, vineyards, and farmland, the Old Mission Tavern provides a beautiful relaxing dining experience in an inspirational setting. In the finest tradition of old world European taverns, the “art gallery” restaurant promises both a culinary and visual feast. Wonderful cuisine with prime rib, fresh fish and seafood, lamb, steaks, chicken, duckling, pastas and signature soups and salads plus a weekly pierogie special make the Old Mission Tavern restaurant a habit with locals and a priority for visitors. The Tavern has provided a warm welcome for travelers for over twenty-five years. Sundays feature a famous country style chicken dinner special. The Thursday night pierogies are made by Verna Bartnick and are a particular delight. The Tavern’s main dining room with a woodburning stove and bar, leads to the “garden room”, brightened with many windows and surrounded by original artwork. In the Bella Galleria itself there is a banquet facility in which private parties can dine in the midst of the artwork.